The following guidelines apply to all riders and include ski tourers who use snowmobiles for initial access. Be knowledgeable of the area you are to travel into respecting any closures or restrictions. Avoid snowmobiling over ski tracks. Bathroom requirements should take place away from main riding tracks. Toilets at recreation sites are available for use. Natural re-growth and replanted trees replenish previously harvested cut blocks throughout the Invermere District. Recent plantations of small juvenile trees above or just below the snow surface can be damaged by snowmobiles. Avoid these areas when possible and only traverse these blocks in order to continue along known riding routes. Generally use of old skid trails or a haul road will minimise impact on vegetation. In general, try to avoid damaging living trees and shrubs while snowmobiling. 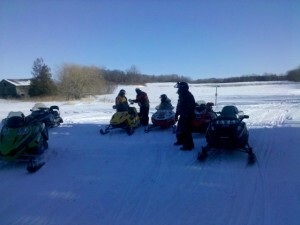 Safe operation of snowmobiles includes knowledge of the machine. Awareness of backcountry hazards, and common courtesy. Leave a trip itinerary with someone and report back upon your return. Travel in pairs (use the “buddy system”) and never ride alone. During night riding reduce speed, drive within the limits of your headlight, and don’t venture off familiar ground or known trails.